Answer: When you’re in an accident with a driver who fails to produce proof of insurance at the scene, you need to call the police immediately. Having a police report on file might matter going forward, and they’re breaking the law by not having proof of insurance with them. Your situation is somewhat unique in that many uninsured drivers don’t come right out and admit it. Oftentimes uninsured drivers will say they don’t have their insurance card with them but do have valid coverage. It’s only after you attempt to file the claim that you eventually find out the other driver was uninsured. That said, many of these cases are pursued without a police report on file, so don’t panic if you don’t have one. The next step is to call your insurance company and alert them about the accident. Don’t file a claim against your own insurance, simply explain the situation so they have it on file. It’s also an opportunity to review your existing coverage and check to see if your policy includes uninsured/underinsured motorist insurance coverage (UM/UIM). UM/UIM insurance is an additional layer of protection that you can add on to your standard policy. It can cover you (and your passengers) when you’ve been injured by an uninsured driver, or cover the remaining expenses when you’re injured by a driver whose liability limits are too low. UM/UIM insurance isn’t legally required in Nevada, but it can be hugely beneficial to have in the event of an accident with injuries. However, UM/UIM does not cover property damage so whether or not the accident produced injuries is key in these cases. If there were injuries and you have UM/UIM insurance, you’ll be covered up to your coverage limit and can move on with your life. It’s when you don’t have UM/UIM insurance that things can get complicated. Med Pay/PIP insurance will also payout if you have it, and it’s possible your health insurance will cover you a bit too, but in many cases these types of insurance won’t cover the full amount needed. Whether the other driver was uninsured, underinsured or even if they have insurance but the claim was inexplicably denied, you should call a personal injury attorney to discuss. Even for minor (or seemingly minor) injuries, it’s important to ensure that you’re doing everything you can to protect yourself. 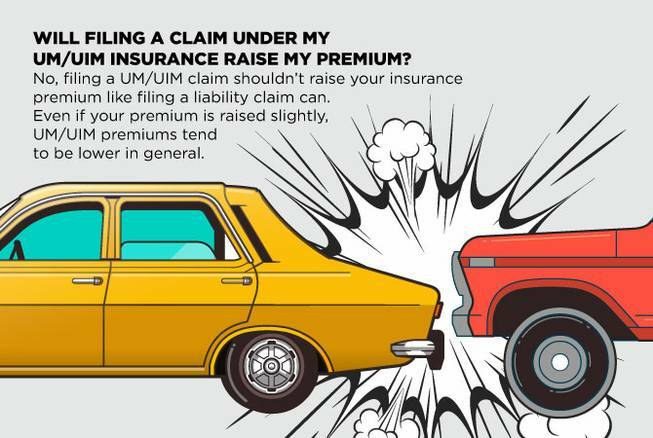 Will filing a claim under my UM/UIM insurance raise my premium? No, filing a UM/UIM claim shouldn’t raise your insurance premium like filing a liability claim can. Even if your premium is raised slightly, UM/UIM premiums tend to be lower in general. Your car may be totaled, but no amount of UM/UIM insurance can help you in this situation. If you have collision insurance, you can file a claim against your own insurance and pay the deductible to cover the damages, but this isn’t an ideal option. Even if your insurance company accepts the claim, your premium will likely increase, possibly costing you more in the long run than if you had simply paid for the repairs yourself. Unfortunately, you will probably have to sue the other driver if you want full compensation for the property damage — but there’s still no guarantee. Drivers who don’t have valid insurance typically don’t have assets the court can award you anyway. In this instance, it’s best to consult with an attorney and go over your case before deciding if a lawsuit is a reasonable option.